1 More steps are here! 1.1 Go for the end of the day shopping! 2 Know basic “Rules of Thumb”! 2.1 Large size is NOT necessarily cheaper. 2.2 Coupons usually provide the most savings on smaller quantity. 2.3 Do NOT depend too much on “brand name” products. Go for the end of the day shopping! Did you know some items get 50% discount after 7 pm?? Like donuts, bagels and other bakery items. What you may not have known is that you can actually pick items on your own. After 7pm, workers start cleaning up all the left overs for the day. They will pick assortments of donuts in a dozen box. Some times you may not want some of these ones you don’t like. So you basically make the box with full donuts of what you like!! Now, once you have what you want, take the box to the worker for a marked down price tag sticker. See, you are helping local workers to clean the donuts shelves!!! In our local store, a dozen new donuts costs around $7.00. If you do this trick, then you get $3.50 per dozen box. That is a good deal! and kids (and you?) will love them!! Make sure to check out rest of the Kroger articles! Know basic “Rules of Thumb”! There are a few things to mention here. So pay attention! Large size is NOT necessarily cheaper. It is most of the time true that if you buy in bulk, things get cheaper in costs. But you should verify this is truly the case. For instance, in many cases, 1 gallon milk is cheaper. However, in some cases, 1/2 gallon milk gets cheaper. In this case, the decision is relatively simple. Double the price of 1/2 gallon milk, and see if that’s cheaper or more expensive with 1 gallon milk. Just get the cheaper one (1 gallon or 1/2 gallon). Pay also some attentions to others which milk they will pick. In many cases when a cheaper price is obvious, people just do get the 1 gallon one which may be more expensive. Coupons usually provide the most savings on smaller quantity. This is true on majority of the cases although some times numbers are very close. For instance, an obvious example would be something like the $1.00 coupon can be used for a smaller quantity item of $2.00 cost or a larger quantity item of $5.00 cost. In this case, the saving for the smaller quantity item is at 50% ($1.00/$2.00), while the saving for the larger quantity item is only 20% ($1.00/$5.00). Long story short, use coupons for the smallest (and usually cheaper) product options!! Do NOT depend too much on “brand name” products. Value brand products like Kroger branded ones are generally cheaper than brand name products. This happens EVERYWHERE in the store from foods to medicine, etc. For these instances, we always check the ingredients. For many medicines, value brand products usually have the EXACT same chemical contents, and prices are generally much cheaper. Next time when you go to pharmacy, compare and look at the details on the label for allergy or cold medications. You will see what I mean. As such, there is no longer a good reason to stay with brand name products. 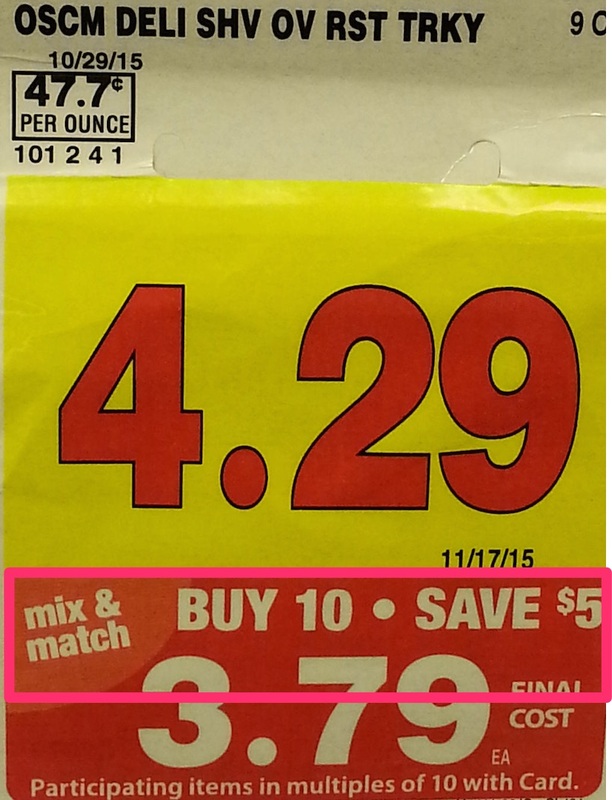 Keep in mind Buy 5, Save $5, is a twice as BETTER deal as Buy 10, Save $5. Because you end up saving $1.00/item instead of $0.50/item!! Also, you don’t have to buy exact same items as long as other items are part of this special promotion. This is a great news because we don’t have to get stuck with one kind of many items at home! !- Buy items you need as part of Buy 5, Save $5, or Buy 10, Save $5 or Buy 10 for $10 deal. 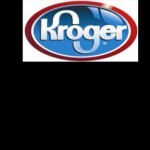 You probably have heard of a Kroger TV commercial advertising Buy 5, Save $5 or Buy 10, Save $5 or Buy 10 for $10 deal. You certainly have seen the sale pic like the one above!!! It seems that Kroger has these deals pretty much every week, and when we go to shopping at Kroger, there are always some deals going on. This requires a bit of planning, but what’s important here is that you buy items that are part of these deals and stock up. Sometimes, what you plan on buying may not be on sale. If you can wait until the next shopping time, then forget about getting non-sale item, and only get the sale items. Obviously, you would then combine with these special Buy 5, Save $5 or Buy 10, Save $5, or Buy 10 for $10 deals. 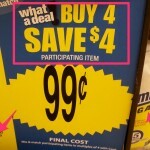 You then combine with other coupons we discussed in step 2. This is where magic starts to happen! Always look for ways to combine multiple saving methods, and stick to them. Recently, there was a 10 for $10 deal for Pringles Chips. We normally don’t buy Pringles because they are usually pricy at $1.50+. If you do a simple calculation, this product becomes $1.00 each. That’s well over 30% savings! We then stocked these up, and I have some snacks to take to work!!! Continue to the last Part IV of these secrets!